Inner space: The power of solitude | eWakening now! It’s no coincidence that in the West even something such as psychoanalysis, which shelters under the official umbrella of being a science, has historically always been more strongly linked to continental Europe and America than the UK. But this isn’t psychoanalysis; this is Vipassana. Meaning “to see things as they really are”, it’s the technique the Buddha himself practised – so before Buddhism itself even existed. Passed on from generation to generation by a chain of devoted teachers, it’s thanks to one of these teachers – a Burmese industrialist called S. N. Goenka – that it’s now taught in centres all over the world. Set amongst 22 acres of rolling countryside, the centre (called Dhamma Dipa – “island of dhamma”, dhamma being “the way to liberation”) is based around an old farmyard. More recently used as a riding school for children, it was bought and converted in 1991. 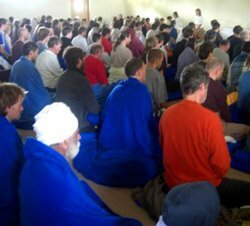 Although Vipassana courses are also held in East Anglia, London and Sussex, Dhamma Dipa is the only dedicated centre in Britain. In the early days it ran courses for 50 students who sat in a drafty barn rather than in the modern hall they do today; and now it can take 130 of them. More than 30 courses are run each year at the centre, most of which last for the standard 10 days – although there are shorter and longer courses for children and students who have been before. In 2008 around 1,300 people completed courses here; in the 18 years since Dhamma Dipa opened, approximately 15,000 people, from all walks of life, have passed through its doors. Perhaps most remarkably, all the courses are completely free. This entry was posted on June 15, 2009 at 12:15 am and is filed under buddhism, meditation. You can follow any responses to this entry through the RSS 2.0 feed. You can leave a response, or trackback from your own site.